You have been having your say on the takeaway plans. Gazette readers have called on families in the borough to make healthier choices when it comes down to food. The message comes after plans to open a new fast food outlet in Frederick Street, South Shields, were rejected due to concerns about local obesity levels. New planning guidance, a document named SPD 22, was introduced across the borough, aiming to manage the increase of hot food takeaways in South Tyneside - and the application for the Frederick Street site became the second in a matter of weeks to be refused. 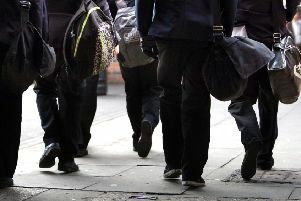 In the Simonside and Rekendyke ward, the location of the vacant Frederick Street shop which could have become a takeaway, more than 46% of pupils aged 10 and 11 are classed as overweight or very overweight. Councillor Tracey Dixon, lead member for Independence and Wellbeing at South Tyneside Council, said: "We take our health responsibilites very seriously and reducing the number of overweight and obese residents is one of our key priorities. “Limiting the number of takeaways in the area is one of the ways we can promote healthier lifestyles, particularly among our children." While some of you agreed that there were an "astounding" number of fast food outlets in the area, many said the responsibility to ensure children are eating well and exercising belongs in the family home. Mark Tiffin: "Again ... blame the food not the lack of exercise, education and life skills. The serious lack of affordable or free sports that everybody can access. Routes to school that encourage active travel. Need I go on?" Kerry Court: "Get the kids off the Xbox and on their bikes with their mates. Nowt to do with takeaways." Col Suddick: "I can't see how stopping a takeaway is going to stop obesity when it's up to the parents to teach kids and also give them the, shock horror, exercise." Lee Pearce: "So by not approving this takeaway do you think the parents are going to think okay let's cook our kids a healthy meal? No they're just going to go to the nearest takeaway and buy from there. Really makes no difference whatsoever." Leanne Michelle: "The trouble is that majority of the time ... junk food is cheaper and easier to access than a healthier option." Diana Lambton: "Teach parents to cook." Sarah Hallimond: " I do agree we don't need any more takeaway places in Shields there's plenty!" Anthony Scurfield: "It’s down to parents to educate children, nothing to do with takeaway or restaurants." Brian John Ellis Williamson: "We need better shops than just takeaway outlets." Dave Barnes: "Ridiculous, trying to put the blame on honest businessmen rather than those who intentionally overeat or allow their children to overeat." Pritam Singh: "The number of fast food places/eating venues in Shields that are open and continue to open are astounding." Clare Vassallo: "it's simple science, you can't blame takeaways or any other food chains for the obesity problem which is worldwide." James Tubbrit: "After the horse has bolted." Dan Jameson: "Wow, I've been blaming the parents for feeding their children the wrong foods and not providing adequate exercise to their children when its really the fast food outlets who are to blame for forcing the food into the mouths of children." Mark Kennedy: "People are saying ‘we need more shops’ but the sad fact is that those shops wouldn’t get used and would end up shutting down."